St. Joseph Parish is a Roman Catholic Church ministering to the community of Lodi since 1917. We are a community of believers, rich in tradition and growing in diversity. We draw our spiritual strength and power from the Eucharistic Presence of our Lord. We provide an atmosphere in which parishioners of all ages and cultures share faith through Sacramental and Liturgical celebrations, on-going faith formation and other social events which enable us to connect our faith with the world in which we live for the greater glory of the Risen Christ. Once upon a time, Lodi was an agricultural fairyland of Dutch settlers who lived in substantial homes along the banks of the Saddle River. The Rennie brothers came along in 1829 and Lodi became the “fastest growing village” in Northern New Jersey. Industry attracted many Irish workers who settled along Union Street, where they built St. Francis of Sales, the oldest Catholic Church in Bergen County. Unfortunately, Rennie’s business baliwick crashed in 1875. Many families moved elsewhere and Lodi turned into a “deserted village of some 2,000 souls. Toward the end of the past century, the Blum and the Boettger brothers tried separately to revive the dying industry. From their merger in 1903 arose the United Piece Dye Works and Lodi “was again on the march!” This rebirth was followed by an influx of hundreds of industrious Italian families seeking employment in the new mills. By a natural process these immigrants formed separate groups along the lines of their inborn loyalty to the one of the two capital cities of their land of origin: Naples and Palermo. The “Neopolitans” settled on Bogart Heights and eventually built there a church in honor of La Madonna di Montevergine. The others put themselves under the spiritual guidance of Father Joseph Ascheri, a zealous Italian priests, who was pastor of St. Francis of Sales Church from 1897 to 1910. 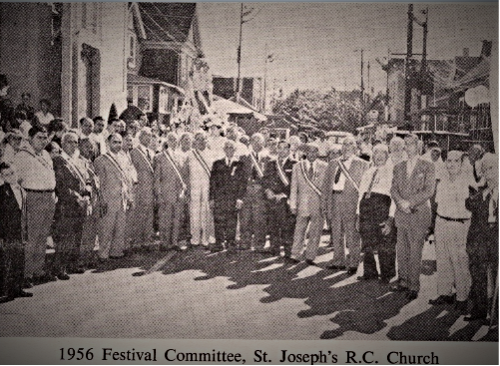 After the death of Father Ascheri in 1910, Father Angelo Giardi, a relative of the Chiossi family, paid occasional visits to the Italian colony and held services for them in the “French Hall” on Church Street. As more and more Italian families moved to Lodi, the Most Reverend John J. O’Connor, Bishop of Newark, saw the need for an Italian speaking priest in our community and sent Father Carlo DiRienzo to set up a Mission Chapel for the benefit of the Italian population. St. Joseph Mission was inaugurated on Sunday, June 22, 1913, in a rented hall at 42 Main Street- the so-called “Maccaroni Hall” at a monthly rental of $18. The first week collection amounted to $23.80, the first Christmas collection was $48. During his short stay, Father DiRienzo followed a busy schedule of daily and Sunday Masses, night services and sermons on Sundays and Wednesdays, novenas, devotions in honor of the Sacred Heart and Stations of the Cross during Lent. Sunday school wad held after the 11 o’clock Mass for a large number of children who received their First Holy Communion on October 5, 1913. He also established the societies of St. Joseph, Mt. Carmel, Holy Name and Children of Mary, had frequent meetings with them and encouraged them to receive Holy Communion in a group on definite Sundays. To Father DiRienzo goes the credit for first participation in the traditional Holy Name Parade in 1913. In the spring of 1914, he was transferred to another parish and his place was taken by Father Anthony Falzone who guided the growth of the Mission into a large parish.